A couple of years ago, I put up a blog post about all the software that I was using at that point, to control the hardware I had at the time. Well, I thought it was time for an update. I've changed my mount, my camera and have picked up several other hints and tips since then, and my software has changed to keep up. One other thing that I have recently added to my collection of hardware is a dedicated imaging PC. The Intel NUC 7i5BNH is around 15cm square and around 4 cm tall. This week, I spent 2 evenings putting on the operating system and all the software I need to start using it. The new NUC carries a 7th generation Intel i5 processor which is more than enough to support the software I require. I won't be using this for image processing, so anything more than this would probably be a bit of a waste. The beauty of the NUC is that once you have decided what processor you want, you are then free to chose the RAM and hard drive size, and fit them accordingly. So, I went with 8GB RAM and a 250GB SATA Solid State Drive. The NUC also comes with an on-board wireless access card. 64 bit Windows 10 Enterprise. The driver bundle was downloaded from the Intel website, and all relevant drivers were installed. Windows 10 actually does a reasonable job of installing what it needs, but given this was a vanilla build, I wanted to use all the manufacturers drivers from the start. I gave the wireless access controller a fixed IP address, and enabled RDP which allows me to remote onto the NUC from another machine on my home network. Everything else is fairly standard astronomy kit. Altair Hypercam 183c (v1) for imaging. There's a requirement to install the software and drivers for all the kit in specific order. None of the installs are particularly tricky though. Where I can, I've put a link to the download locations I used. I use this for selecting targets and slewing the telescope to them. It saves having to rely on using the handset on the mount. It's free and opensource software. available from here. Once installed, there is not much to do, other than set up your location. If you move around several observing locations, you can save all the locations in the 'Observatory Database'. All you need is the GPS coordinates of the location. At the end of the process, the software will be able to connect to the mount, but there are a few more things to go through first. This is imaging/capture software from Altair, designed to work with their cameras. Although I don't actually use this software, there is some important information on the Altair downloads website regarding the drivers of the Altair cameras. From experience, I can say that as long as their instructions are followed IN ORDER, then you shouldn't have any problems. You don't necessarily need to configure Altair Capture, but by installing their software, all the latest drivers for all their cameras are installed. Note, DO NOT plug any camera into the PC before installation of the software. I have invested in a lifetime license for SharpCap Pro, and use it as my only image capturing software. If I buy a different camera in the future, then it supports cameras from all the main manufacturers, and is continually being developed and added to. According to the SharpCap website download page, most users should only ever need the 32 bit version of the software. So, that is what I have used. I downloaded the latest version, installed it and applied my SharpCap Pro license. As I had installed Altair Capture before hand, I was able to connect my Hypercam and GPCAM to the NUC via the powered USB3 hub, and connect SharpCap to them both. I use SharpCap for polar alignment, via the GPCAM guide camera, and then perform the rest of the imaging with the Hypercam, which is why it was important to check I could connect to both cameras at this point. These are the first of 3 sets of ASCOM drivers required for each piece of software to talk to hardware. In this case, for the Altair cameras. I downloaded these from a link the on the Altair downloads page. Although available for download, it is actually a feature which I enabled within windows. After enabling this feature, the NUC needed a reboot. It is a prerequisite for the next download and install. Without this in place, I could not continue with the remaining installs. A quick internet search will tell you how to enable the feature. This is a platform of different ASCOM drivers for controlling all sorts of hardware. The latest platform is available from the main ASCOM downloads page. These drivers are the final piece to the jigsaw, allowing the computer, and the various pieces of software to talk to the SkyWatcher mount. These are also available from the ASCOM website. under their Telescope/Mount Drivers section. That was it for the basic installs. The NUC was now able to talk to the hardware, and all the software was able to communicate with what it needed to. Each piece of the software needed a little more configuration in it's own right, but no further set-up was required. I expect I will need to refer back to this in the future when the time comes to rebuild, the NUC, or if I invest in a new machine. Up until that point though, I hope it helps others too. I've had somewhat of a hiatus from astronomy and astrophotography for a while. So, when a weekend at the start of February presented itself with good weather (a rarity in these parts this Winter) and a new moon, I was determined to get outside with all the kit. Setting up out the back garden highlighted how rusty I was, when it come to getting everything right. The slick operation that had been refined over the many months previous had turned into one of head scratching and re-tracing steps to get things all done and dusted. Eventually, I had everything ready (ish) and so I threw myself into my first night of imaging for quite a while. I wanted to try for a new target, something that I had not imaged before. 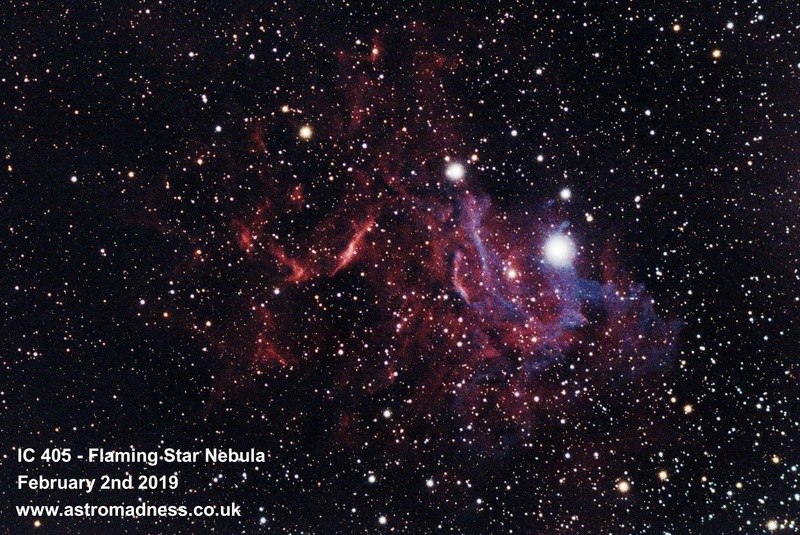 Not knowing if it was even possible to pick up this nebula, I selected IC 405, The Flaming Star Nebula. I had seen many images of this by people using mono CCD cameras, but nothing from the Hypercam range of OSC cameras. I decided to give it a crack, and collected 30 light frames, followed by 29 dark frames. The next morning, I collected 30 flat frames. IC 405 is in the constellation of Auriga, and is around 1500 light year away. This image is made up of 30 x 3 minute exposures, 90 minutes overall. 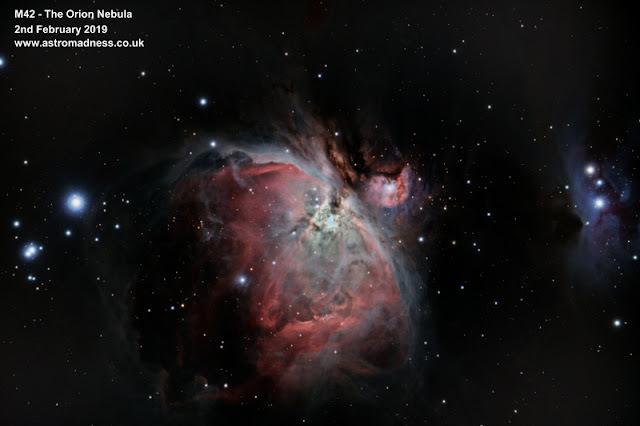 As a first attempt at the target, and the first time back in the astronomy seat for a while, I'm quite pleased with it. It's a bit noisy, which is something I could sort out with better processing, and different camera settings, but overall, I'm happy. That night, I decided to image a second target. M45 is the 'go to' target for many imagers at this time of year. After all, it's well positioned, bright, and colourful in OSC and DSLR cameras. Surprisingly though, this is only the second time I had imaged this target with the Altair 183c Hypercam. Because of it's brightness, I needed to be careful not to blow out the core of the image too much. In a way, restricting the amount of data I was collecting. It's very hard to do this, and the final image relies on some processing to bring out the detail in the central, brighter core of the nebula. I was able to use the same dark and flat frames when creating this image, but this time, I only used 22 light frames. The Orion Nebula is in the constellation of Orion. On a clear evening with good quality skies, it is visible naked eye and is a mark of how much, or how little light pollution you have. This image is made up of just over an hour of exposure time. So to the crux of this post. It was great to get out under the stars again. To have everything set up, working away without too much hassle was a timely reminder to me of how much I had missed sitting outside in sub zero temperatures, getting annoyed with neighbours lights, and not being able to feel my fingers. Good times! But, the big development I made this time around, and the thing that I had learnt came at the calibration stage of processing. Last September, I thought I made a huge break through in the calibration stages of my images. In truth, I probably did, but could I repeat it? No. I refer to the thing that is common with the highly sensitive Hypercam 183c series, and that is the amp glow and sensor/star burst that appears in the right side frames. Particularly in the dark and light frames. A single dark frame, stretched in PixInsight shows up the anomaly. Here's the theory if you're not familiar with the process. The light frames capture all the detail from the target you are imaging. But, they also contain lots of other anomalies. These could be sensor anomalies as is the case with the Altair Hypercam, but also pixel noise etc. Taking dark frames (exposures with the cap on) gives you a series of frames that contain nothing other than whatever is produced purely by the camera and the imaging train. During the calibration process, in principle, you stack up all your dark frames to produce one single 'master dark' frame. All the noise and anomalies in this master dark is then compared to each of the light frames. The software (in this case PixInsight for me) looks at the master dark frame and subtracts whatever the anomalies are in there from your light frames. Theoretically, you are then left with a much cleaner set of light frames which can then be further calibrated before finally being stacked to produce your single image, ready for processing. Hope that makes sense. In my case though, I couldn't get this to work reliably. I would go through the whole calibration process, and still be left with a final image containing all the noise and anomalies which should of been removed. Then, along come the eureka moment. I don't know about you, but seeing things in video, as someone else is doing them is all well and good. But when it comes to doing it myself, I find it easier to have everything in notes with some screenshots etc. So, I set about typing up my notes which I can now carry with me, and refer to whenever I need to. I've made those notes available for download if you want them. A huge thank you to Mitch for putting up this tutorial, and a massive plug for his YouTube Channel Definitely subscribe to it, if only to pick out little gems in some of the videos. So, that about wraps up this post. Thanks for reading!